Follow NIS America's August home video release of Daily Lives of High School Boys in North America on August 6th, the anime adaptation of Yasunobu Yamauchi's manga, produced by Sunrise and directed/written by Gintama's Shinji Takamatsu is now streaming on Hulu. 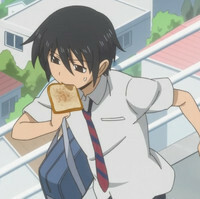 Join Tadakuni, Hidenori and Yoshitake as they undergo the trials and tribulations of life in high school! Each episode presents the boys and their classmates in unique situations that you may or may not have faced in high school yourself! You'll laugh! You'll cry! (But hopefully laugh more.) You'll be astounded by the zany antics of the Sanada High School community! In the near future, the international community is thrown into chaos by a series of attacks by the evil criminal organization known as Galactor, and only the Science Ninja Team Gatchaman is capable of stopping the threat. Hand-picked by the brilliant scientist Dr. Nambu, the five young members of Gatchaman are ready to face the most nefarious plans of Galactor; and win!